While I can't say "No" to a great cup of coffee, I have found myself enjoying more cups of tea lately, thanks in part to samples sent from the folks at Teatulia. I don't know what it is, but when the fall/winter months roll around, I find myself reaching for tea bags or hot chocolate to warm me up on those chilly New England days -- which seem to be daily these days. Do you have a favorite tea? My mom can't live without Earl Grey tea, so I have to make a point to have tea bags on hand when she comes to visit. For me, I like green tea. Not only does it offer health benefits, but I love the taste of this loose leaf tea. So, when the folks at Teatulia offered to send me two sample containers of their premium 100% Organic tea, I knew one of the varieties would be Jasmine Green Tea. The second sample sent for me to enjoy was Teatulia's popular Tea Medley, which consists of 7 different tea varieties. There are so many other great varieties of Premium Organic Tea to choose from when shopping online at Teatulia, including bulk loose leaf tea and 50/100ct teabags I keep telling my husband how I want to try Neem Nectar Tea, a full-bodied black tea. Because my husband and I both love bold coffees and teas, this variety sounds right up our alley. 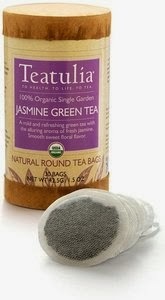 Click here to visit the Teatulia website now -- http://www.teatulia.com/. Thanks to the kind folks at Teatulia, one lucky reader will win three containers of the following teas (which ended up being my favorite varieties from the samples sent): Jasmine Green Tea and White Tea, along with my mom's favorite, Earl of Bengal Tea.